We had our extended family Christmas in Picton, Ontario on the 26th ~ hosted by my Dad and his wife Rosanna. What a lovely evening it was! I thought I would share some of their wonderful Christmas decorations. 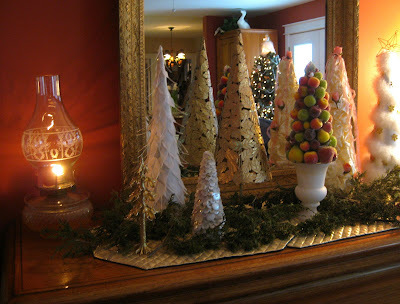 I love the display of mini Christmas trees above the fire place and the reflection of the larger Christmas tree in the mirror. 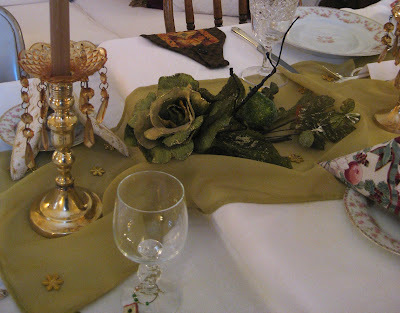 The Dinner table was decorated with tiny gold snow flakes, an organdy runner and gold and green flowers. 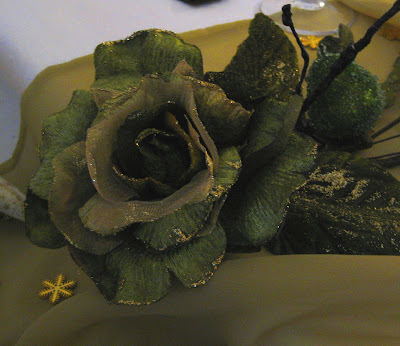 The candles also had a green and gold theme. This Christmas project is really neat . 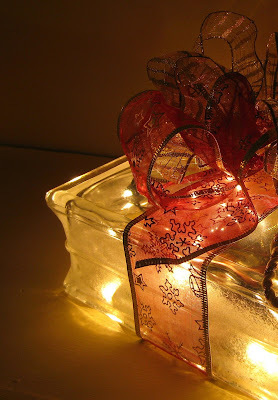 . . a glass block with lights and ribbon to make a glowing display. Such a pretty decoration. 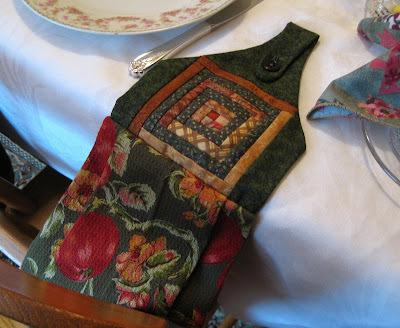 Each guest was given a table favor ~ a hand quilted guest towel. Rosanna made 17 of these, each one custom designed. So much work !!! This is the one I received ~ a Log Cabin Quilt pattern for my love of antique quilts. Thank you Dad and Rosanna for hosting this year and for such a wonderful evening with family. Best wishes for 2009. Happy New Year to ya!!!!! Very Pretty. I love your hand towel. 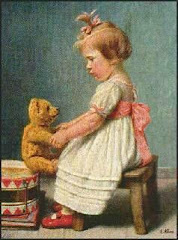 There is nothing better than hand made gifts. 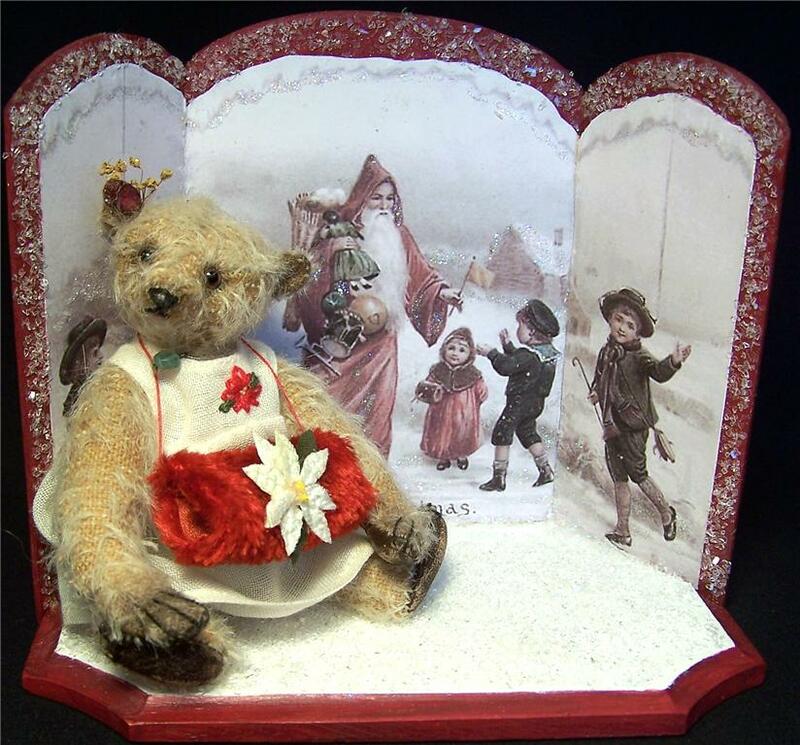 Glad to hear you had a good Christmas! I saw one of those glass blocks at a friend's house on Christmas. I should have checked it out better. Have a Happy New Year!! Oh how beautiful Karen ~ looked like it should be in a House & Garden magazine. I love all the colours and the glass block gift is lovely. Your hand made towel is so pretty and what a lot of work, making for each guest. Glad that you had a happy Christmas. Thank you for sharing those beautiful photos! That mantle is beautiful~definately magazine worthy! Love the little glowing glass block present. The tea towels are an amazing feat! What a wonderful experience! 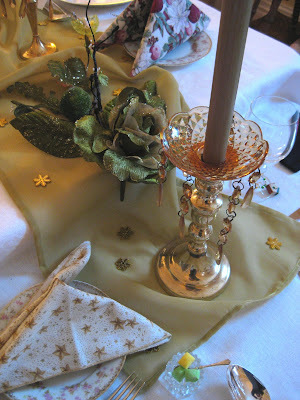 What a pretty Christmas setting and the hand towels are so lovely and such a thoughtful gesture. What a beautiful setting. I hope your holiday was wonderful. Happy new Year. Boy, Rosanna has been busy! Those towels are lovely. 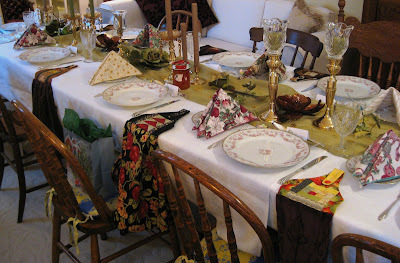 The table looks gorgeous - she really has a flare for putting things together. I love the glass block - should have taken more pics of that for me LOL!